It's not everyday that you get to visit the House of Lords so when CILIP CIG announced that they were organising a visit to the library there I jumped at the chance! We began with an introduction to staff from both the House of Lords (HOL) Library and the House of Commons Library. Although the two libraries work in close contact with each other they essentially provide different services to different audiences. 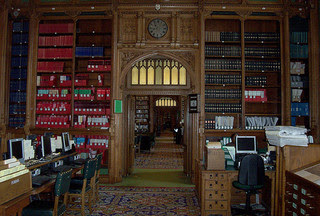 The HOL Library has a much wider focus, as dictated by the issues discussed by their users, whilst the House of Commons Library is focused on more regional and local issues. Staff gave us a talk outlining their route to RDA. The HOL Library have always tried to keep up with the latest developments in cataloguing and so started to follow the progress of RDA quite early on. One of the main concerns for the library was whether their users would benefit from a transition to RDA, a choice that I'm sure is foremost in the minds of many libraries. The HOL is a small library with an internal catalogue not available to the general public, meaning that they wouldn't benefit from the way that RDA makes data more widely available. The majority of the research is carried out by library staff on behalf of their users, and obviously staff are well versed in how to search. In addition to this most of the resources that the library houses are print and so wouldn't benefit from many of the major benefits of RDA linked to electronic resources. Ultimately the library decided to make the transition. They felt that given their history of keeping up with the latest standards and the fact that many of the major research libraries were switching, they would be left behind if they didn't adopt RDA. Since the HOL is a small specialist library they have made extensive use of the Internet for information and training, citing both eforums and Twitter as excellent sources of information. Working in a large library, access to training has'nt been a problem for me but I appreciate that this is not the situation a lot of people find themselves in. I was particularly gratified to see that the HOL Library has been using the CambridgeRDA website in their training and finding it really useful. The HOL have been able to share some of the costs with the House of Commons Library who, although not yet using RDA, are still keen to follow progress. The HOL Library started using RDA in June 2013, although like many institutions they are still accepting AACR2 where nothing else is available. All original cataloguing is being done in RDA and it is hoped that as more institutions adopt the standard, RDA records will become the norm. The main message that I took away from the visit (apart from how gorgeous the library was and how much I would love to work there!) was that it is important to remember that there are many smaller libraries for whom implementing RDA is a major challenge. At Cambridge there have been many challenges involved in implementing RDA but there was never too much question over whether to use it or not. Visiting the HOL Library has given me a broader perspective on this issue as well as an insight into life in what must be one of the most beautiful library's in the country. Teaching myself some new tricks!